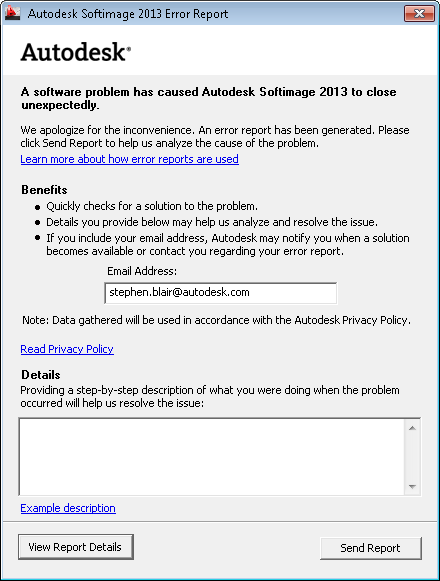 Autodesk applications like Softimage use senddmp.exe to send CER reports to an Autodesk server, where the CER reports are automatically processed and entered into a CER system. senddmp.exe is installed with Softimage, in %XSI_BINDIR%. You cannot submit CER reports by email; the system is not set up to handle that. The CERs have to be submitted to the Web service that does all the grunt work. For example, the Web service takes care of extracting the crash dump and matching it up against the symbols for that version of Softimage. You will find dumpuserinfo.xml and dumpdata.zip in the XSI Temp folder (for example, %TEMP%\XSI_Temp_7558, where 7588 is the process ID of xsi.exe). The .dmp and .ScriptLog.txt files actually exist in your Softimage user folder; senddmp.exe just takes a copy of them and puts them in a .zip archive. When I left Autodesk, I had 253 crash dump files (90MB worth) lying around under different C:\users\blairs\Autodesk\SoftimageXXX folders. I suppose you might be able to run senddmp.exe yourself, but the command line is rather complicated. Here’s the senddmp command line for a recent crash I had. Note that I formatted it for readability. Also note that I didn’t actually try to run it myself, I just dug up the details (using my old friend Process Monitor). /SAMPLEDESCALTPATH "C:\Program Files\Autodesk\Softimage 2013\Application\bin\CER\exampleDesc.htm "
You can get the /APPXML and /CALUMPTIME from dumpuserinfo.xml. I think /COUNT is the crash count. This entry was posted in Crashes, Troubleshooting and tagged CER, crashes, Softimage by xsisupport. Bookmark the permalink.